I am invariably saddened when I come across Facebook profiles of people who have not uploaded a cover picture into their Timelines. It is possible that some of these people have not bothered to learn how to; and in that case, this tutorial should be very useful. Those who simply leave their Timelines without covers pass up an opportunity to make a statement about themselves or something that they like or believe in. First of all, the term Timeline ‘Cover’ may be something of a misnomer. From a print publishing point of view, the ‘Cover’ approximates more the ‘masthead’ that one finds at the top of the front page of every newspaper. At any rate, the Cover is an 850 x 315 pixel slot at the top of the Timeline into which a picture can be fitted. The picture may either be uploaded straight from the hard drive or chosen from among pictures previously uploaded into Facebook. Clicking ‘Ok’ will bring down a menu that offers you two choices. 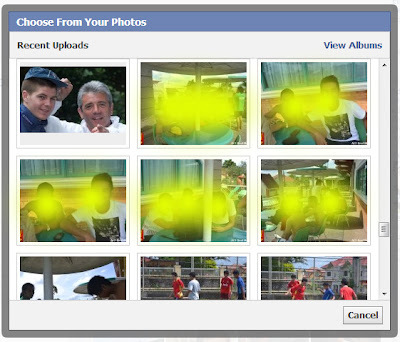 Choose Photos will enable you to select a Timeline Cover from the pictures previously uploaded into Facebook. A pop-up window as shown in the graphic below will appear. Choose one from among the pictures then click ok. If you wish to look at other albums, click the View Albums link at the upper right hand corner of the window. Upload Photo will ask you to find a photo in your hard drive to use as Cover picture. Simply navigate to the directory in your hard drive where the picture is located, click on the picture and Facebook will do the rest. This is the part where some Timeline Covers fail. Unless your picture is exactly 850 x 315 pixels, chances are that it will fit badly into the slot. Most badly fitting Timeline Covers are because users who are testing the feature are uploading for the first time fail to notice that Facebook has thoughtfully included a function for positioning the picture. This instruction appears at the center of the uploaded picture. I hope you have noticed that the mouse pointer has changed into a hand icon. Click anywhere on the picture and drag up, down or to the left or right until you are satisfied. 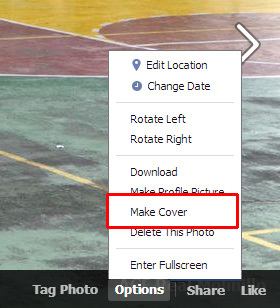 Click Save Changes to finalise your Timeline Cover or Cancel to choose another picture. By default, all Timeline Cover pictures are given the privacy setting of ‘Public.’ This means that your picture will be visible in search engine results. If you are handy with graphics editing software, you can really spruce up your Timeline by making your own artistic cover. All you need to remember is that an 800 x 315 picture fits perfectly into the Cover slot and when uploaded, no re-positioning is required. If you are not savvy at all with graphics software, you can choose from a variety of web sites that specialise in Timeline Covers. A sampling will be provided at the end of this tutorial. Clicking on the button will drop down a menu that will allow you to change, re-position or remove the current cover altogether.